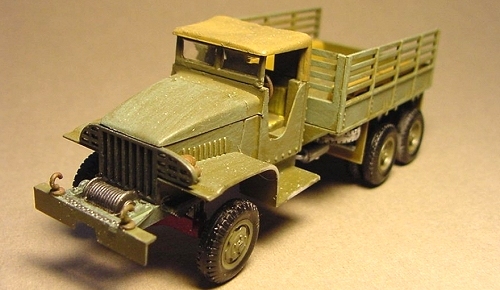 Almost 1 million of these standard trucks were produced during the second world war, hauling ammunition and troops in every theater. The “lend-lease” act enabled them to be used by allies as well as US soldiers, and the vehicle gained a loyal following by virtue of it’s unbelievable ruggedness and cosmopolitan nature…there was very little that this truck could not be adapted to do ! Carrying up to two and half tons of cargo, or a small squad of armed troops, the 353 could still haul down the bumpy road at an impressive 40 miles per hour, and stay on track by virtue of it’s eight rear wheels, no small feat in the mud of French roads ! 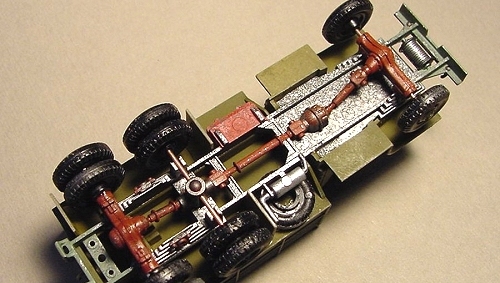 From a modeler’s perspective, this is a gem of a craft…almost anything you can imagine, it actually did ! It was a true workhorse of the armed services. Over 50 small pieces go into this kit, and they fit very well together, matching up with locating pins and blocks. 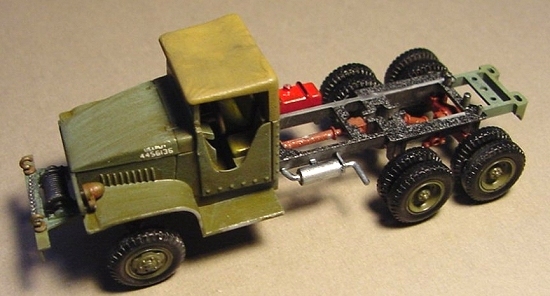 The 3 sprues are molded in a flash free light olive drab styrene , with three copper axles being provided also. This kit is molded to represent a canvas topped vehicle, not a steel cab type, so all of the kit parts for the top (A7 and C2) have a light pattern of fabric etched into the plastic. The boxing is standard Hasegawa…fantastic cover art, thick cardboard, and heavy exterior sprues in bags. The decals are nicely printed, and as usual, work very well. First things first ! I sprayed the entire group of sprues with a flat grey primer to begin with…after drying, I brush painted the tires satin black and the rims in Model Master Olive Drab . The transfer cases, surprisingly , don’t match up too well, so a bit of filling and sanding was necessary to get them to look even…don’t widen out the end holes in the cases, even though they look odd…if you get them too far out, the axles will wobble. I assembled the undercarriage first, and painted it olive drab with a wash of flat black…once this was dry, I lightly brushed the whole affair with rust and a bit of steel, to give it a bit of a “worn” look. Transfer cases were painted rust, and the frame was overbrushed with aluminium and flat black The tires were placed on the copper axles after drying well, and threaded through the cases, with the metal being used, this kit is very sturdy! Electing not to use the canvas top for the rear, I weathered the plank bed of the truck (B6) with pastels after painting it the same olive drab as the rest of the vehicle. 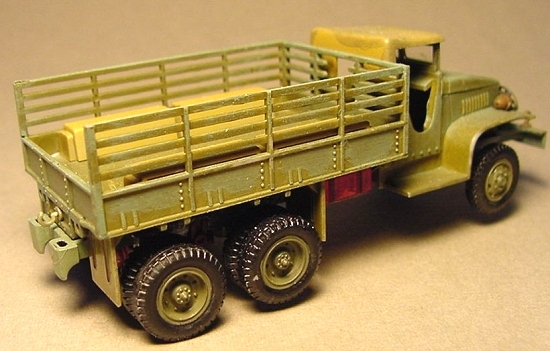 Painting the benches (C4) in Field Drab helped “pop” them out from the blandness of the truck, while still retaining the drab colour, and then they were installed along with the siderails and tailgate…add on the mudflaps, and you are ready to place it on the frame! The Cab is the only real downfall to this kit…it is sparse, sparse, and more sparse. Since I was using it as a “filler” vehicle for a diorama, I didn’t worry too much, but if this is going to be up front, you are going to want to invest some time in scratchbuilding a much better interior. When the Cab and the Bed of the truck are in place, you are for all intensive purposes, finished ! This kit needs to be painted as it is being assembled, for sure ! I try to vary the tone of a standard colour (in this case, OD ) by adding small amounts of lighter and darker colours to give the kit some depth…if you paint as you go, this is easy enough to do, and it really does stand out in the end! The decals are typical Hasegawa…easy to work with. The kit comes with three serial numbers, but you might want to scrounge around for some other white jobs in your spare’s box …I opted not to use the large star on the hood (according to those who were there, it was one of the first things overpainted). For the windshield, I used Krystal Klear as the kit doesn't provide any transparencies. OK, I am a dedicated Airfix fan…and more recently have become enamoured of the kits coming out of the Ukraine, Poland, and Russia (where 1/72nd seems to be more popular than here), but this is a very well constructed kit that is suited quite well to the use of diorama display…on it’s own, it is going to need some serious overhauling and a lot of scratchbuilding additions. 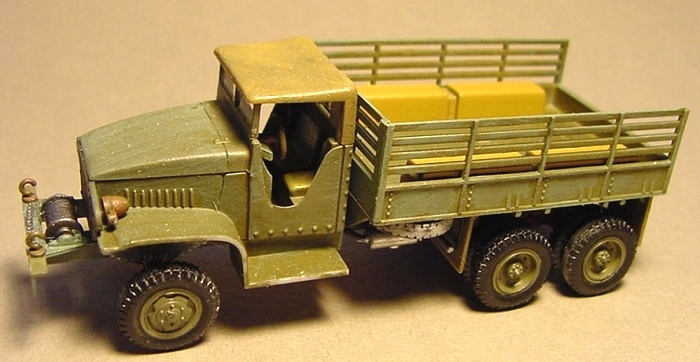 One of the great things about the GMC, is that the full size version (that would be 1/1 scale) is usually around at any military show, and you can hob-knob with the owner about where the truck has been, and imagine where it could have gone…perfect for a modeler! !